Useful portable workplace or even a portable mini storage space unit (without the monthly rent payment). 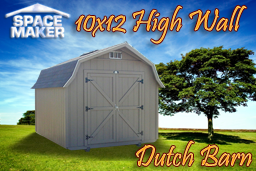 The 10x16 gable provides the versatility needed to provide for your requirements in practically any use and never having to choose a prefabricated building. Space Maker choices may be personalized and constructed to order. Uses cover anything from a small portable storage, workstations and office space. With this custom made building choices you can have the size building which fulfills your preferences without being concerned in regards to the building using up an excessive amount of space inside your yard. 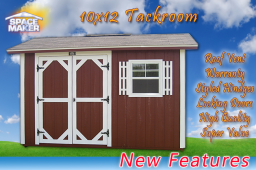 The 10x16 dimension is an ideal size for a portable small storage building. You can now store large yard and swimming pool equipment and tools or even store your ATV, bikes, and motorbikes for which you don't have any room within your garage. You can rely on this gable to provide ample area for whatever you'll want to store in an organized fashion. Additionally, if you wish to move to a new home or even arrange your backyard to produce a lot more space, the portable storage space gable is easily moved from one spot to another. Unlike prefabricated structures, this building is created to your requirements and may end up being customized in many strategies. 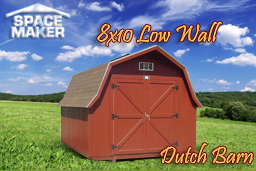 The 10x16 wooden gable also incorporates Western Fir siding, which uses a baked on paint primer to increase the life of the exterior paint to be able to expect your building to look good for years into the future with little if any maintenance. Double doorways with a metal threshold as well as robust hardware help to hold out the weather and maintain temperatures within consistent. 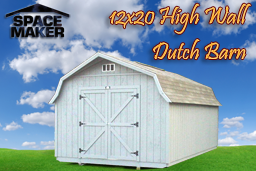 You may also choose to include a second set of doors on another side, in the event that you prefer to enter the portable storage building from more than one point. Regardless of the reason you are searching for extra space by using an outdoor building, the 10x16 gable is a good solution, as all of our products can be. 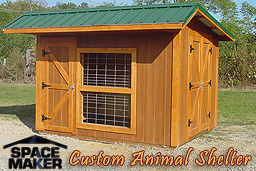 If you need something somewhat different, take a look at the additional styles in addition to our ability to create custom buildings to suit your needs.